Friday, May 30, 2014 at 8:00 p.m.
A Hallwalls Artists in Residence Project (HARP) residency, made possible in part by a major grant from the National Endowment for the Arts. Hallwalls is pleased to announce a three-day artist residency project with the brilliant and enigmatic master musician, instrument builder and educator Cooper-Moore. 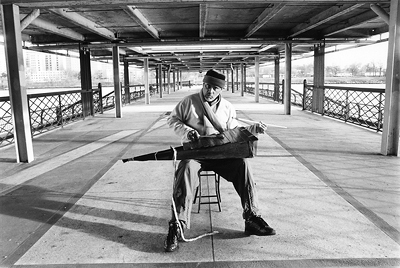 Cooper-Moore is renowned as a powerful and unique performer on piano as well as his own array of homemade string and percussion instruments. During his time in Buffalo he will be working with the students at Buffalo Academy for Visual & Performing Arts and performing in concert with a Buffalo-based ensemble. 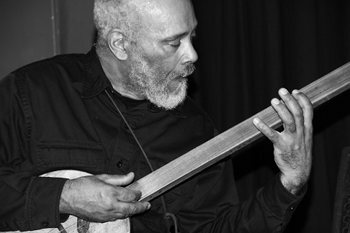 Cooper-Moore is a composer-improviser, instrumentalist, designer and builder of musical instruments, and music educator, living and working in New York City. A native of the Piedmont area of the Blue Ridge Mountains of Virginia, Cooper-Moore began studying piano at age eight. Four years later, he was listening to the musics of Thelonius Monk, Charles Mingus, Ornette Coleman, and working on improvisation. He earned a B.A. in Music Education from The Catholic University of America in Washington, D.C. and later studied composition-arranging at the Berklee College of Music in Boston, MA. Moving to New York in 1973, Cooper-Moore leased the five-floor 501 Canal Street building and transformed it into an artist live-in/work space, making possible numerous experimentations between performing and visual artists.